For most subscriptions, you can give billing information access to members of your team from Subscriptions in the Azure portal. If you're an Azure customer with an Enterprise Agreement (EA customer) and are the Enterprise Administrator, you can give permissions to the Department Administrators and Account Owners in the Enterprise portal. To assign roles, see Manage access using RBAC and the Azure portal. Those roles have access to billing information in the Azure portal. People that are assigned those roles can also use the Billing APIs to programmatically get invoices and usage details. For more information, see Roles in Azure RBAC. 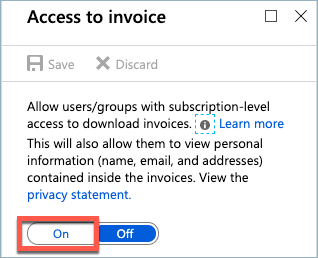 After you assign the appropriate roles to members of your team, the Account Administrator must turn on access to download invoices in the Azure portal. Invoices older than December 2016 are available only to the Account Administrator. As the Account Administrator, select your subscription from the Subscriptions blade in Azure portal. Select Invoices and then Access to invoices. The Account Administrator can also configure to have invoices sent via email. To learn more, see Get your invoice in email. 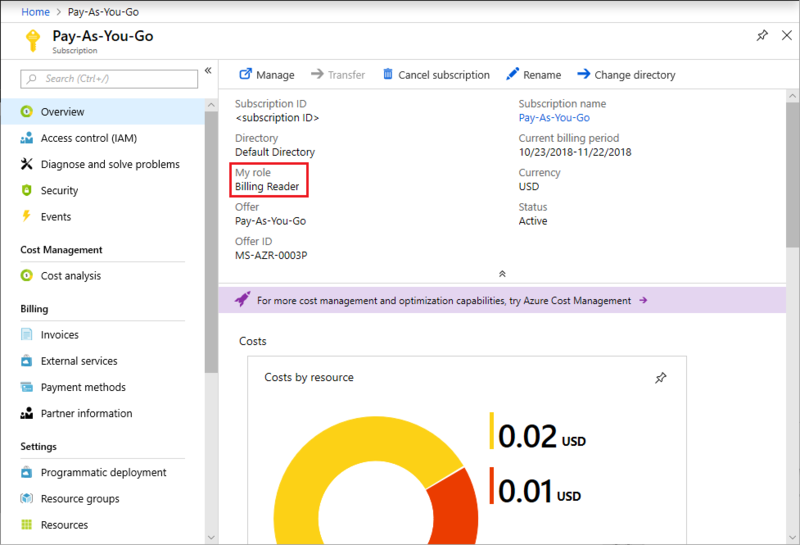 Assign the Billing Reader role to someone that needs read-only access to the subscription billing information but not the ability to manage or create Azure services. This role is appropriate for users in an organization who are responsible for the financial and cost management for Azure subscriptions. If you're an EA customer, an Account Owner or Department Administrator can assign the Billing Reader role to team members. But for that Billing Reader to view billing information for the department or account, the Enterprise Administrator must enable AO view charges or DA view charges policies in the Enterprise portal. The Billing Reader feature is in preview, and does not yet support non-global clouds. Select your subscription from the Subscriptions blade in Azure portal. Select Role assignments to view all the role assignments for this subscription. In the Role drop-down list, choose Billing Reader. In the Select textbox, type the name or email for the user you want to add. After a few moments, the user is assigned the Billing Reader role at the subscription scope. The Billing Reader receives an email with a link to sign in. The Enterprise Administrator can allow the Department Administrators and Account Owners to view usage details and the costs associated to the Departments and Accounts that they manage. As the Enterprise Administrator, sign in to the EA portal. Under Enrollment, change the DA view charges to Enabled for the Department Admin to view usage and costs. Change AO view charges to Enabled for the Account Owner to view usage and costs. For more information, see Understand Azure Enterprise Agreement administrative roles in Azure. The Account Administrator is the legal owner of the subscription. By default, the person who signed up for or bought the Azure subscription is the Account Administrator, unless the subscription ownership was transferred to somebody else. The Account Administrator can create subscriptions, cancel subscriptions, change the billing address for a subscription, and manage access policies for the subscription from the Account Center. Users in other roles, such as Owner or Contributor, can access not just billing information, but Azure services as well. To manage these roles, see Manage access using RBAC and the Azure portal. For more information about roles, see Built-in roles for Azure resources.